Want us to let you in on a little secret? Here’s something most longboard companies don’t tell you. You probably think that the deck is the most important part of a longboard… right? The deck is important, sure. It’s the bit you stand on. It’s (usually!) the only part of your longboard to touch any part of your body. Its shape, concave, profile and construction all have a big impact on the experience you are going to have when you push off. We think it’s actually the trucks that make all the difference. If you think about it, your entire body weight, plus all the force you put through your feet to turn and steer, AND all the feedback from the road surface, all have to go through your trucks. As it’s your trucks that are responsible for making your board turn when you lean, it’s the quality and setup your trucks that have the biggest impact on how your board feels when it turns. We started longboarding because we were looking for a feeling. If a board doesn’t feel good, then what’s the point? That’s why we never skimp on trucks. All our setups come with the best – Sabre Trucks. Wheels are also important. 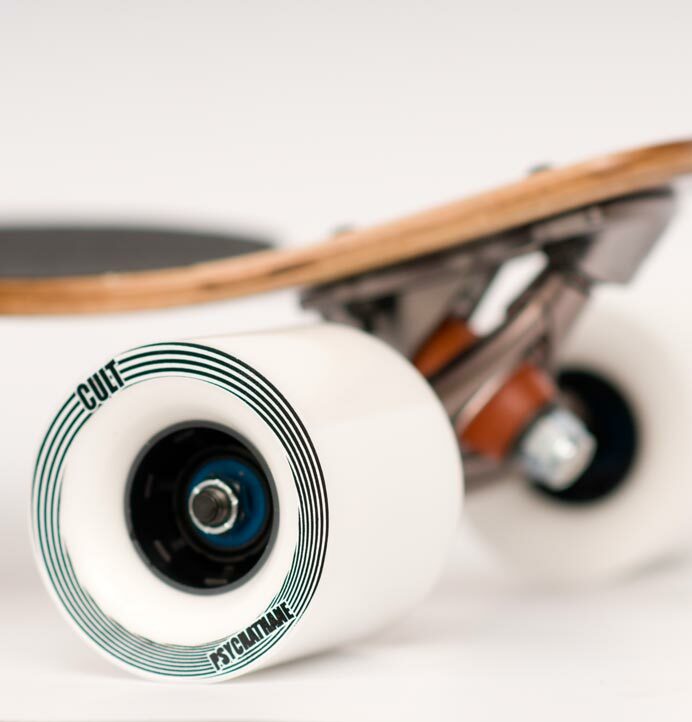 So we spec the best Cult Wheels that we can on all our completes for the price. Primo Sabre Bearings and hardware finish all our builds off. We sell most of our boards with a choice of setups. Different setups work best on different boards, so we’ve specced accordingly to give you as much choice as possible. This is the setup that we recommend to pretty much everyone. We’ve chosen the finest trucks and wheels we can spec, and squeezed them in at a price that everyone can afford. If you buy a elite specced complete, you are getting the best we can put together. 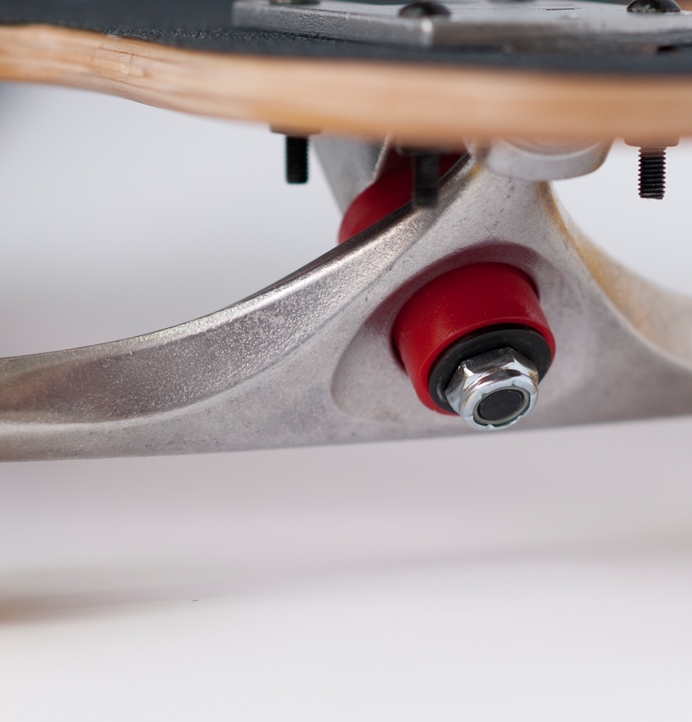 Sabre Forged Precision Trucks are super strong, super light, but most importantly, they feel amazing. 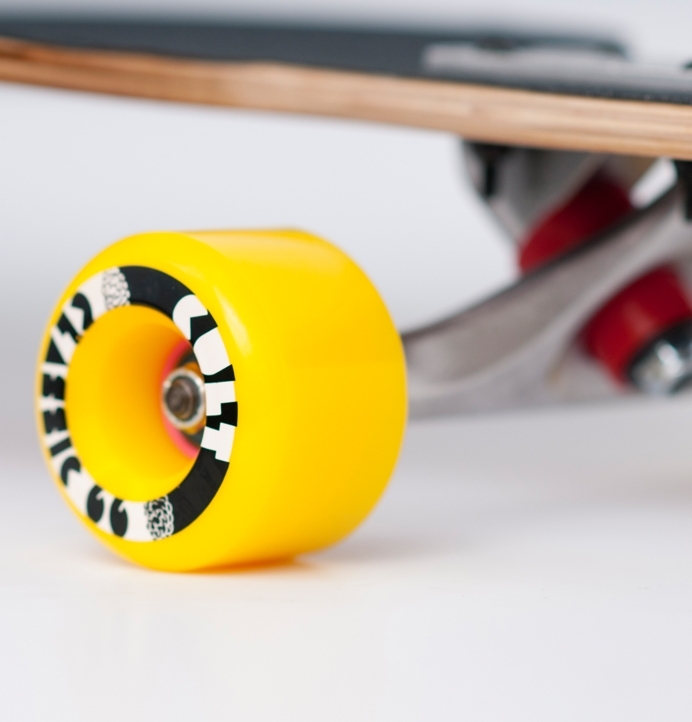 We also use top-end Cult Wheels at this price point, poured from race-spec high-end urethane in shapes and cores perfected by the Cult Team for maximum performance and fun. Sabre bearings keep everything rolling super smooth. And yes – we use bearing spacers! 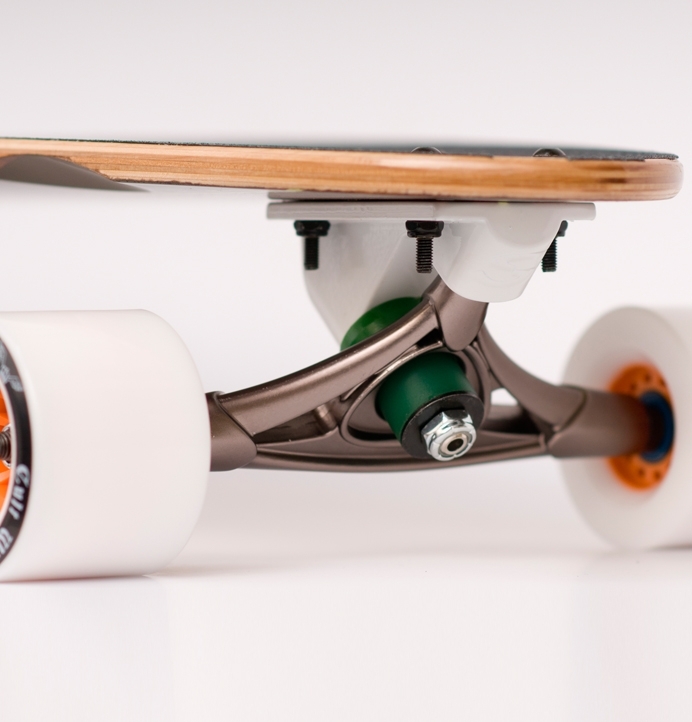 Skate a Lush Elite Complete, and you really understand why we love longboarding this much! Sabre Forged Precision Freeride Trucks on the Mako Elite - super smooth carves all day! Cult Raptures on the Samba Elite - super grippy race-winning urethane. This is usually the best value option to choose from when building a board. We’ll be building you up with Sabre Trucks, usually Sabre Standards or Street trucks depending on the wheelbase. Cult Wheels keep you rolling smooth and fast, and smooth Sabre bearings do the spinning. Gravity Cast Sabre Trucks with premium Sabre Bushings on a Pro Freebyrd. Want to roll on some Lush quality whilst keeping the price down? Choose a Standard Complete. You can definitely get more from your longboard with an Elite or Pro setup, but a standard will get you rolling for less.